This house needed a LOT of WORK! The nice couple that sold us the house was so happy we would just take the house as is! 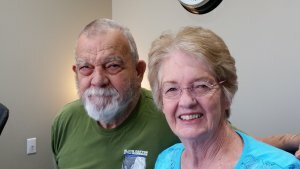 Thanks Jim & Bonnie for trusting us with your house. It was a privilege working with you two! Have you ever thought: Is selling a house that needs work and repairs worth it? Good…let’s talk about that. It is really quite simple, you either make all the necessary repairs yourself (or hire someone) or sell your house as-is. Selling a house that needs major repairs (or even minor repairs) can be a tough problem if you do not have the time or money or simply do not want to make the repairs. Sometimes people just don’t want to take the time to do the work and want to sell their house quickly just as it sits. Part of the problem selling a house that needs a lot of work is the bank will typically NOT LOAN MONEY to a buyer on a house that needs all the work done, OR the bank will require a very large cash down payment. Finding a buyer with deep pockets can be hard. So what is another option? What is Another Option if you want to Sell A House That Needs Repairs? 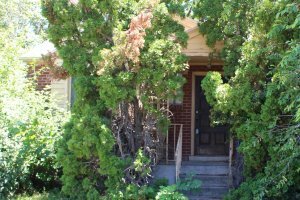 Selling a house that needs work along the Wasatch Front can be a real pain as mentioned above, OR We Can Buy Your House As-Is from you. With our offer, you will know UP Front how much you will receive at closing. We meet once at the house, then there are no more inspections most of the time. You may leave any contents in the house that you do not want. We will even donate useful items to charity. At Gary Buys Houses, we never want anything to be a hassle for YOU. We can help with probate, or the City if they are hassling you about the yard or something, or with the bank if there is an issue with the mortgage, or just about anything. So what are all those repairs you DON’T have to make if you sell your house as-is? We are going to list them below with pictures. Pretty interesting stuff. We can buy your house with ANY REPAIRS that need to be made. Do you have a repair item not on the list below? Please, Call Gary today at 801-382-9199 to see if we will buy your house with the repairs it needs. 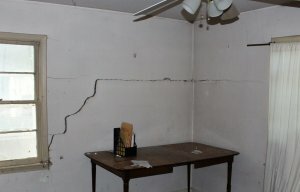 List of House Repairs You NEVER have to make when you sell to Gary Buys Houses. My Yard Is All Weeds!! The back was twice as overgrown and had stuff everywhere. The yard in the picture had overgrown grass and weeds everywhere. You can see the dead trees in the front park strip, the dead wood next to the house and piles of garbage in certain areas of the yard. At Gary Buys Houses, we love to tackle large yard projects. We don’t care if your yard is all weeds or you have HUGE Chinese Elm Trees! We will certainly buy your house with any type of yard problem just as it is. Gary Buys Houses is Your Local Trusted house buyer and your Choice for fair and honest service. No More Yard Upkeep and Watering!! My Roof Is Leaking Everywhere! This roof had leaks all over. It’s OK…we will still buy your house. This was probably the LEAST damaged part of this roof! This particular house had water damage INSIDE of the house. At Gary Buys Houses we have bought houses that have had to have all the roof sheeting removed and trusses fixed before we could start to fix the roof. No roof job is too big for us. Call Gary Parker today at 801-382-9199 to get started. I promise you will be happy you called. Old aluminum or steel windows tend to let water in when it rains. Boy bad windows can really make a house hard to live in. They are either letting in the heat or cold, and if it is windy it is 3X as bad. The rain will get in and start to ruin any tile or window seals. Sometimes even sheet rock can be damaged. Broken or missing windows are not a problem for us. Just like any other repairs, we want to buy your house as it is. 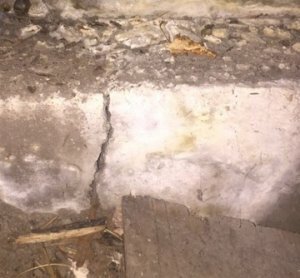 Large crack in a foundation. Cracks in Foundation Walls, Interior Walls or Floor Cracking, Cracks in Outside Bricks or Doors & Windows that Stick are all signs of foundation problems. In some parts of the Country, foundation problems are very common; however, in Utah foundation problems are not as wide spread. But, they can certainly happen. 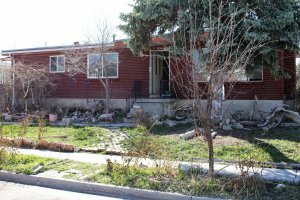 In Utah, one of the first signs of a foundation problem are large cracks in exterior bricks or large cracks inside the house. Most of the foundation problems we see are repairable. 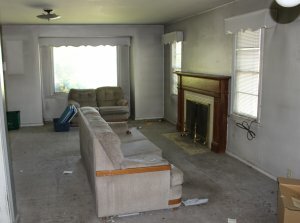 This house needs paint and carpet bad. Paint and carpet only last so long no matter how good you are at taking care of them, and every buyer will want new carpet and paint that is in good condition. Even in a seller’s market. Sometimes, if the house will pass FHA inspection for example, you can list and give the buyer a credit for the old carpet and paint. If the only repairs your house needs are carpet and paint, the house may be able to be sold as is especially if it is a sellers market. Of course, we will buy your house if it needs carpet and paint and even if it doesn’t. Large cracks in the wall. 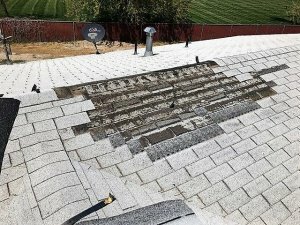 Water damage from a roof leak. Water damage can happen from a leaky roof as in the case of the picture, or it can come from water getting into a basement and ruin the bottom part of your sheet rock. 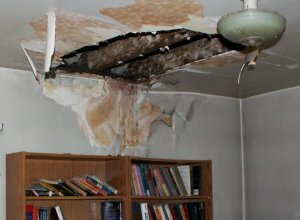 Yes, Gary Buys Houses will buy your water damaged house. Kind of gross, but we will buy your house even if the sewer is backed up. We have in the past. 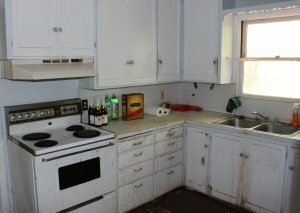 Kitchens get a lot of use and abuse so it is no wonder many kitchens need work. Cans get dropped on the floor, kids hang on cabinet doors, flooring comes up, water from the sink gets everywhere and so on. No matter how bad of shape a kitchen is in, you can sell your house to Gary Buys Houses. Kitchens and bathrooms right? Like kitchens, bathrooms get a lot of use and abuse. 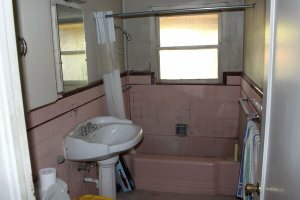 The bathroom in this picture is 50+ years old, but that is OK. We Buy Houses no matter what your bathroom looks like. Things were built better 50 years ago, because I have seem bathrooms in 1970 and 1980 houses in worst condition than this house. if you are selling a house that needs work? What if you have Meth in your House? That is OK with us, and we will still buy your house. The good thing about us is that we know the legal requirements for testing. It is very important to properly coordinate who tests the house and when. This all matters if you want to stay in the house for a while after we buy it. Read about Meth here. When Was Asbestos Used In Homes? If you have the pop corn type ceiling with the little reflective things in it, most likely you have asbestos in your house. Maybe even of you don’t have the reflective things, you could still have asbestos. Yep, we can buy your house. So if you are thinking yes, selling a house that needs work is the direction I want to go…call us today at the number below. At Gary Buys Houses your house can never need too much work for us to buy it. Even if all the repairs on the list are needed by your house, we will buy your house. Do you have a repair NOT on the list? Call me so I can add it to the LIST! We would love to take those repairs off your plate. Most people have one or two big repairs their house needs, but some houses need a ton of work. These videos are of houses in various states of repair and illustrate the wide range of work a house can need. Some of these videos are of completed projects. This video is of a house that needs a lot of work. The METH has just been cleaned up, and we are ready to start with the repairs. This house has roof, plumbing, electrical and interior cosmetic issues. This video is of a house about 3/4 completed. This house had a full Meth Remediation done and had ALL the plumbing replaced because it was Polybutylene (the grey pipe that bursts). The sellers were interested in selling a hoarder house, so we bought it! The interesting thing was that most of the items in the house were GOOD ITEMS that were probably useful to someone. So what did we do on a 20 degree winter day, Invite some people in that could really use the items. We got a ton of thank yous this day. Glad we did this. This is a video of the street and the people on a 20 degree day in Salt Lake City that were here to go through a house to your left. So sometimes when someone is selling a house that needs work and REPAIRS, and there is a lot of stuff you don’t want, we will put the items to good use. Gary Buys Houses is LOCAL & Trusted.